We Smell a Rat - CHARTER SCHOOL WATCHDOG http://www.charterschoolwatchdog. To be fair to lawyers, who seem to always get a bad rap -- there are some decent attorney's out there who actually care about preserving the integrity of the law. But this guy might not be a member of that club. This guy --the lawyer in question-- Sulejman Dizdarevic sits on the Board of Directors at Chicago Mathematics and Science Academy. Dizdarevic was recently the target of a protest against the Board's unwillingness to negotiate with the teachers who are trying to unionize the school. The teachers -- if you remember -- voted with a 67% majority to unionize, and yet -- the Board has rejected their wishes and election results; instead throwing how many thousands of dollars at lawyers to contest it. The protesters erected a giant inflatable rat outside of Dizdarevic's law offices as a part of their protest. Why a rat one might ask? We think using a rat to symbolize the Board's actions is a great analogy. Rats sneak around, lurking and ready to pounce on their prey (that would be the American teachers), ferret out food to devour (that would be their own people that they extort money from), bite their enemies with ferocity and viciousness (that would be anyone that exposes their corruption), and reproduce at warp speed (that would be the never-ending H1-B visa scam). So sure -- we can see why they used a giant rat to symbolize what the Board is doing. But, our question to them is simple -- can you send about 154 more of those rats -- we could use them at all of the boys' schools? And we will provide the cheese. 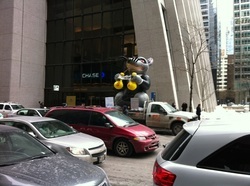 Above is a picture of the "rat" (the inflatable one that is) and below, a story about the protest. Follow the link and you can watch the video. CHICAGO - If Sulejman Dizdarevic were peeking out the window of his swanky law offices on Feb. 11, he surely would have been startled. There staring at him from the opposite side of the street, with bulging eyes, long nose and whiskers, chomping on a cigar and holding sacks of cash, was a giant, ugly rat. Teachers at the school voted 67 percent in favor of joining the Chicago Alliance of Charter Teachers and Staff (Chicago ACTS) in June of last year. CMSA management fired Rhonda Hartwell, a leader of the organizing effort who was eight months pregnant, fifteen minutes before teachers announced they were forming a union. CMSA said her firing was for budgetary reasons but later announced a $1.5 million profit. The teachers saw joining the union as a means to gain a voice in school decisions. They have been shut out and the resulting frustrations contributed to a high turnover rate. They have been in a battle for recognition ever since. Instead of investing resources in staff salaries, CMSA hired a notorious, expensive union busting firm, Seyfarth Shaw (partner Jim Powers has since left the law firm but took the CMSA account with him). "Regardless of the anti-union reasons motivating these charters, we are finding fear of transparency is the key issue," said James Thindwa, an organizer for Chicago ACTS, which is affiliated with the American Federation of Teachers and now represents teachers at eight charter schools. The battle for union recognition by charter schoolteachers has grown as charters have assumed a larger presence in the city. The Board of Education voted to create another 13 charter schools on Jan. 26. "CMSA are saying this is a private school, not subject to state law," said Thindwa. "They walked away from the bargaining table despite the fact that this union is certified under state law. What CMSA is saying is they don't recognize the state." Charter schools are covered under Illinois Educational Labor Relations Board and employees are required to get the support of 50 percent plus one to gain union recognition. CMSA refused to accept this and took their case to the National Labor Relations Board, claiming they were a private company not covered under the law. But the NLRB ruled CMSA is indeed a public school receiving public funds and management must follow state law. CMSA has appealed the decision and in the meantime walked away from the bargaining table. Thindwa said every board member of CMSA would be targeted for pressure because they were personally responsible for the downward spiral the school finds itself in. They started with Dizdarevic; a delegation of community, clergy and academics delivered a letter to his office demanding management comply with state law. "We told him we are not going away," said Martha Biondi, a professor at Northwestern University. "We are community members concerned about the right of teachers to organize a union, especially under the law of Illinois. It's outrageous that they are flouting the law of Illinois." Episcopal Church Deacon Tim Yeager joined the protest because "it's for the teachers to decide if they want a union. They've chosen to have one. It's none of the management's business but management is obligated to sit down and bargain with them over the mandatory subjects of bargaining. They should do it."